And we all do that. That sounds like an admission of guilt, not a statement of fact. Again, you're not describing virtue-signalling. Maybe a little research is in order. How do you figure that i'm not describing virtue signalling? I just did. Correct me. I've seen the literal definition. Yes, no? Don't worry, all this hype of a blue wave will be consumed by fire! How damned stupid can the Progressive left get but to promote destroying one of our founded amendments ahead of an upcoming election? Is this what they call educated? Christ! Sun Tzu would love this snip! Do you mean to say only evil Conservatives believe in the 2nd? I lmao at those who assume this. Those on the far left, brain washed by the television and the lights of Hollywood, have no idea of the amount of Democrats who shudder at how their party went anti American and full blown Marxist! See ya'll on the field of battle! MAGA!!! If one of these pliable nuts gets it in his head that someone other than the perpetrators of such crimes are the ones responsible (and given the media’s uncritical amplification of these voices, they already have), there is no telling what he might do. This is exactly what they are counting on. Then they will 'report' and it will get consumed. Over and over again. Since Columbine, my opinion stands that this has been by design. The more gravy they get out of these stories, the more likely they are to plant the potatoes.....so to speak. It's not the far left though.. think Jill Stein --she had other issues way more important than this. It's the establishment Democrats and that's why the democrats are going down. Establishment democrats. I don't think the kids are trying to get rid of our rights. They just want something done. The hijackers are seeing low hanging fruit to get their names out there for re-election. Republicans and Democrats are making their own rise/demise right now. Repubicans can't just hop on the coat tails of Trump like alot of mid term elections go. Trumps first couple of years has been to chaotic. These congressional races are on their own and will win or lose on their own merits as it should be. 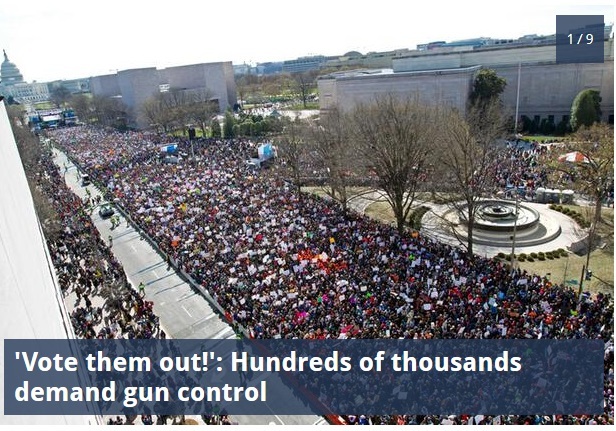 Peering through a variety of images and videos, it appears many people marched in support of the victims, pleading for society and lawmakers to address the issue of school shootings, and rightfully so. With the help of the media, however, a louder, more political message consumed it. A narrative resembling and likely coached by a certain political affiliation grew louder, and many activists revealed themselves to be the paramilitary wing of the Democratic party, and not the spokespeople of victims and justice as they made themselves out to be. Do I see keyword inserts there, something you have slipped in to make the rest of the narrative true, just to turn young people who have lost friends into little devil shiites? just for your opinionated self. Seems like there is no bottom to your machinations. No flags, no two stars...oops sorry, no star for you. edit on 27-3-2018 by smurfy because: Text. And I found that just trying to open my email. Imagine if I were all about putting a big thing together along those lines. I see what I see. Your own machinations come from the same bad faith as them, and you're not even traumatized nor coached to do so. I have seen countless time, the term, "Virtual Signaling". Could someone please explain it to me. Use small words. I'm slow.